Imagine that you’re taking a road trip from Miami to New York City. You set your GPS, get your playlist ready, grab your snacks and start driving… and you wind up in Chicago. It’s only then that your GPS tells you about the wrong turn you made 700 miles ago—information that would have been far more helpful when it actually happened. Getting the right feedback is helpful; getting it at the right moment is crucial. And it’s just as true for financial information as it is for driving directions. This is real-time financial feedback, and it can make the difference between an easily fixed minor issue and a major problem that takes much longer to resolve (if it can be resolved at all). When you’re making important business decisions, the best way to be well informed is with current, comprehensive and contextual financial data. For example, when an organization is considering investing in resources (whether it’s people, equipment, facilities, or technology), decision makers need to know if they have room in the budget for it and the ability to secure funds to pay for it. If the accounting department takes 30, 60 or 90 days to produce accurate financial reports, decision makers don’t have a true understanding of current financial information. As a result, they may get in over their heads if they believe the financial picture is better than it currently is. The same goes for when you’re trying to manage costs. With real-time financial feedback about individual projects, you are more likely to find issues early. Then you can proactively discuss with your team and resolve it at that moment—instead of discovering it after the work is done and you no longer have the luxury of getting back on track. The direct benefits of real-time financial feedback are pretty straightforward. You’ll be able to make decisions more quickly because it’s easier to see your financial picture. You can also adjust your financial position incrementally (i.e., “tweak” your spending) until it’s just right. Real-time financial feedback makes it easier to see (and appreciate) the impact other people’s work has on the overall financial picture of your organization as it happens. This enhances the bond and cooperation between teams and helps break down silos in your organization. People providing input are more likely to feel that their contributions and expertise are valued, which boosts morale and can increase buy-in for the changes that need to happen in order to get back on track. With both direct and indirect benefits, real-time financial feedback increases the chances of success for your organization. However, it’s not always easy to obtain information in a timely manner or to even know what is relevant for decision making. So it’s key to first evaluate why it takes so long to get this feedback and consider which information is needed quickly and frequently (and what information is not as important to have in real time). Perhaps your accounting department is maxed out, working overtime to create a binder full of financial reports that takes three months to get into your hands. Yet you only look at certain pages of those reports. While their tardiness isn’t their fault, the issue still needs to be addressed if you are going to succeed in achieving real-time financial feedback. It’s possible that the pages you don’t use take up a lot of their time, or other events occur in the day-to-day accounting that delay their ability to even start generating reports. Streamline your accounting processes. Get to the root cause of why your accounting department takes so long to close the books and produce meaningful reports. Keep your feedback relevant and concise. Have a basic understanding of the story your financials tell. Know what is relevant to your operations and how to recognize red flags. Work with others in your organization when you spot financial concerns to develop a fix. Collaboration with your team means more than just pointing out issues; it involves two-way conversations to develop a strategy for improved financial performance. 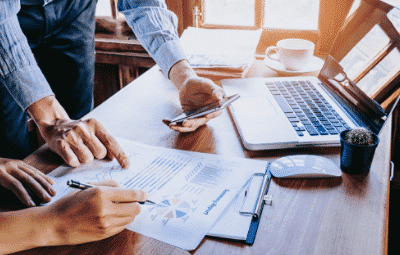 By streamlining your financial reporting and achieving real-time financial feedback, you’ll get to the root of an issue more quickly and have a better chance of resolving it with minor changes. It’s an important tool used by our Operational Excellence team as we help our clients grow their bottom line. Imagine what it can do for your organization!